Here’s a photo of my beautiful ruby cabbage, just after being picked. 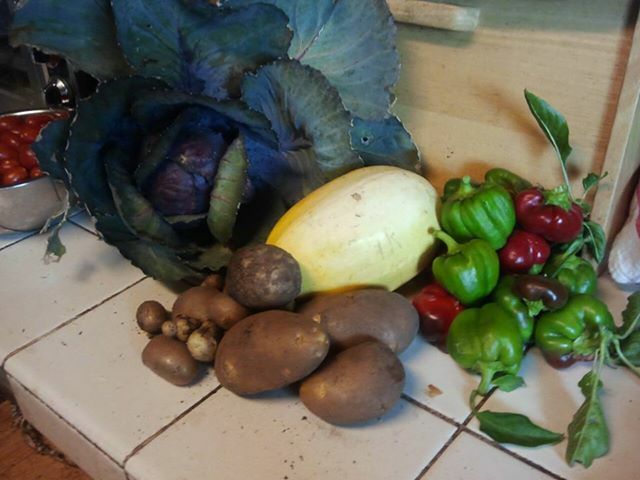 It was a great day to harvest in the garden. I decided that the cabbage was looking a bit “done” with growing, so decided that Sunday was The Day. I didn’t have a clue as to what to do with it, but I didn’t want the bugs or whatnots getting to it before I could, so I decided to deal with how to fix it later. When I picked said cabbage, I found the plant marker that came with it when we bought it, and on the back side was a delicious recipe for sweet and sour ruby red cabbage. Perfect! The Answer to my Prayer! How could I go wrong? It’s An Art. Ruining Cabbage. 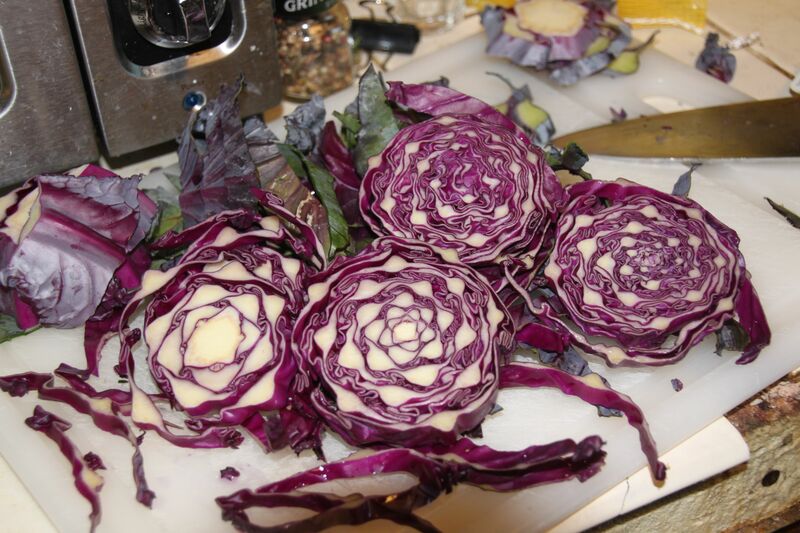 Okay, so the recipe goes like this – 1 2lb red cabbage, sliced thin (about 12 cups); 1/4 c butter; 6 Tbsp sugar; 2/3 c balsamic vinegar; salt & pepper. And proceed as you would expect. I fell in love with the patterns inside the cabbage. The problem? I had one cabbage. Not two pounds. Certainly not twelve cups. But I forged ahead anyway. Pan? Check. Melted butter? Check. Cabbage? Check. In it all went, along with the sugar. Cabbage, simmering in butter and sugar. Six tablespoons of sugar didn’t seem like a lot until I was on tablespoon four. And then suddenly, six seemed like too many. But I’d put in the requisite 1/4 cup of butter, so the six tablespoons of sugar seemed necessary. So I went ahead and did that. As well, I added the 2/3 cup of balsamic, stirred it, put it on low and covered it. Thirty minutes? Seemed like a lot of time, but okay. By this time, the house started to smell like cabbage. 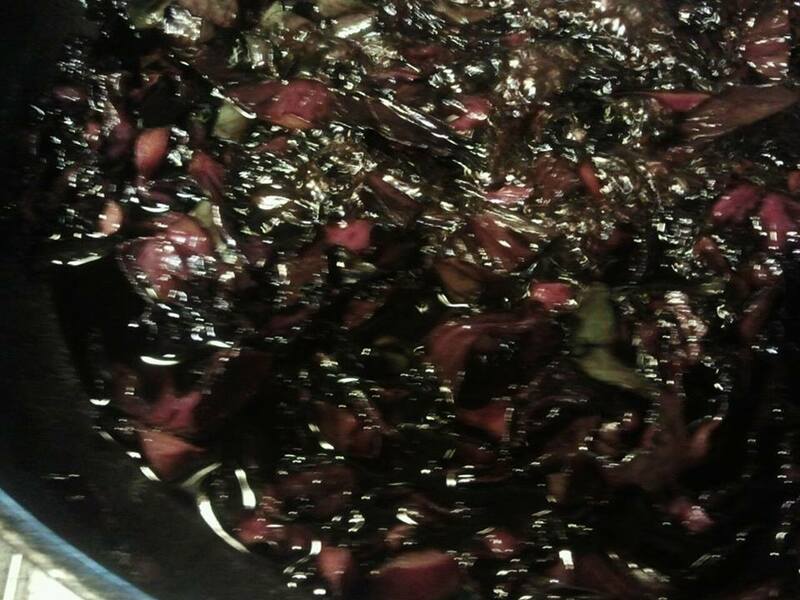 With a heady balsamic scent, yes, but…unmistakably cabbage. I began to remember why I liked my cabbage in salads. I’m not totally sure what happened after that, but I think I was on the computer. Or maybe I was reading…At any rate, the buzzer went buzz and I went to check on my masterpiece. Um. Well…crispy. Crunchy. Kind of like molasses-covered, fried-in-butter cabbage, only not really. The juices were thick and black as tar. The cabbage was either burned, crispy, or raw. (Not sure how that happened.) I served it at the dinner table, because I wanted the boys to understand that even Mom has a bad day cooking but you should try everything once. We tried it. I tossed it. A novelty dish that threatened the health of your teeth AND tasted of cabbage? Yeah, no. Here’s the sticky mess, in all it’s glory…I snapped this photo before the EPA took it away. 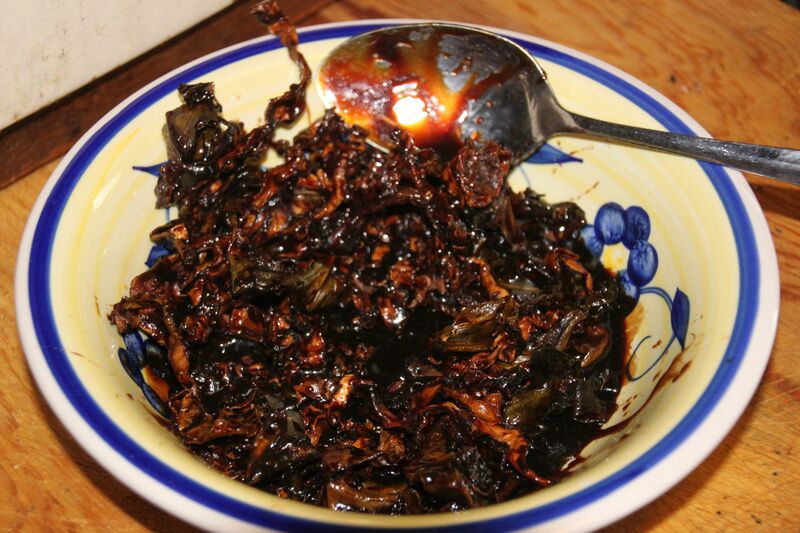 Carmelized cabbage. A new taste treat? Prolly not…lol! Eldest son spent most of Monday afternoon scrubbing the tar – I mean, the carmelized balsamic – out of the pan I cooked it in. He napped for almost two hours afterward, poor dear. And so the carmelized cabbage goes into the family notebook about bad dishes served with enthusiasm. My hubby still teases me about the Spam casserole, and that was 35 years ago! So what disaster in the kitchen have you had recently, or has someone served you? Let’s laugh! And just for fun, ANYONE who wants one can have an e-copy of either one of my books (or both! ), Demon Soul or Demon Hunt, and my short short, Blood Dreams. Just let me know, leave me your email address, and I’ll send it to you! Demon Soul and Demon Hunt are available for the Kindle and Kobo! Have you fallen into the Caine Brothers’ world yet? This entry was posted in Cooking, Life, Observations and tagged Blood Dreams, Christine Ashworth, Demon Hunt, demon soul, EPA, Free books, Kitchen disasters, Red Cabbage. Bookmark the permalink. Mona, I like steaming cabbage, and sprinkling nutmeg on it. YUM! How long do you bake your cabbage for, and at what temp? Because that sounds yum, too…! Thanks for the laugh, Christine. Reminds me of the time when I was a child and my grandmother burned the gravy on Christmas. She never lived it down. Still hasn’t even though she’s long departed. Some stories are too good to let go of, and I’m afraid you’re in for a lifetime of reminders. At least you can laugh about it. Cheers. Cheers, Suzanne! Glad you got a giggle out of it…hugs!!! Yeah, see…I’m of the opinion you could have done everything perfectly and it still would have been a messed up mess…’cause, cabbage. I think it’s really an ornamental plant, not meant to be eaten, just like broccoli. Ooh Sam, but I LOVE broccoli! It’s my go-to veg! I love cabbage! Like, I’ll just slice it raw and chomp on it all day. So imagine my disappointment that this didn’t work out! It sounded so wonderful. Balsamic vinegar? Yes, please. I wonder how long your house will smell of cabbages… Thanks for the giggle this morning. I was hoping the recipe would be a success, but at least you got a great story out of it! Tameri, I suspect that if you use the correct proportion of cabbage to the other ingredients, and stand over it stirring every few minutes, that the recipe would be mighty tasty. Give it a try! Sarah, what a great idea. I’ll bring brownies! My worst experience was when I ran out of hamburger buns and improvised with hot dog buns and hamburgers cooked to fit the buns. Needless to say, my husband and son looked at what looked to be “turds in buns” and ran the other way! lol! LOL – I’ve done this, too. I see absolutely nothing wrong with it!